When I'm in the sand and have plenty of room between me and the pin, I like to let the ball run most of the way - that's much easier and safer than trying to explode it all the way to the cup on the fly. For this shot I position the ball about midway between my feet. 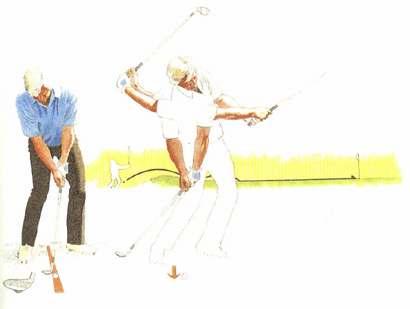 The clubface is open and laid back, which means it's pointing about a metre right of my target and the face is angled almost toward the sky. This address sets me up for a markedly upward backswing, which I emphasize by breaking my wrists quickly. It's not a long swing - my hands don't go beyond shoulder height - but I do swing forcefully down and through to a full finish. The ball comes out quickly and with almost no spin. I usually try to fly it about a third of the way to the hole and let it run from there.